Dedicated to excellence in winemaking in the Finger Lakes region since 1977. Journey through the rolling hills and discover our full portfolio of wines. 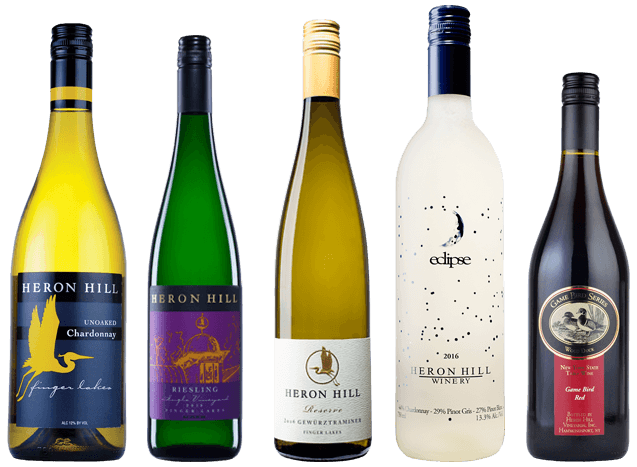 Heron Hill is among the leaders in recognizing Riesling as the region's flagship varietal. Heron Hill Winery was chosen as one of the ten most spectacular tasting rooms in the world by Travel + Leisure magazine! In 2018, the Finger Lakes was named "Best Wine Region" by USA Today determined by popular vote. Visit our Winery and Tasting Rooms in the Finger Lakes. Fall Hours (after Labor Day): Fri.-Mon. 12pm to 4:30pm The café will close for the season on Sunday, October 28th. Heron Hill has won many awards for its distinctive, elegant wines and continues to be at the forefront of Finger Lakes winemaking. Our majestic Genesis Event Tent accommodates up to a maximum of 170 guests, overlooking estate vineyards and beautiful Keuka Lake.